Dr. Seuss both wrote and illustrated his most famous works, but he did create a few books illustrated by others, usually using a pseudonym. He wrote Wacky Wednesday under the name Theo. LeSieg–his own name, Theodore Geisel, turned around. It was illustrated by George Booth. Wacky Wednesday tells of one Wednesday when everything was wacky: shoes on the wall, bananas growing on an apple tree, worms chasing birds, and much more. 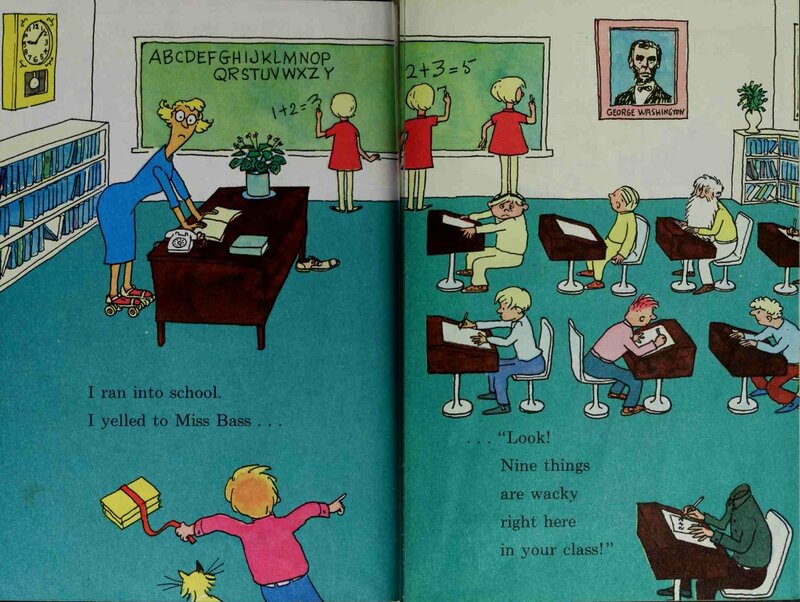 Seuss’s text is very much secondary to Booth’s illustrations. The text of each two-page spread announces the number of things that are ‘wacky’ in the accompanying illustration, inviting the reader to find them all. “Only twenty things more will be wacky,” he said. The type of wackiness varies, exercising different skills: counting (how many wacky things have we found? ), spelling (‘schoul’ is not the right way to spell ‘school’), domain knowledge (a portrait of Abraham Lincoln should not be labelled ‘George Washington’), and simple attention to detail (turtles do not belong atop trees!). Wacky Wednesday is a great book that encourages participation from the reader. It’s appropriate for April Fool’s Day or any day. This entry was posted on April 1, 2014 at 9:23 am	and is filed under Book, Review. Tagged: children's book, Dr. Seuss, George Booth, picture book, Theo. LeSieg, toreview. You can follow any responses to this entry through the RSS 2.0 feed. You can leave a response, or trackback from your own site.